Regulations | Hookers Fly Shop and Guide Service. Your Smokies Fly Fishing Experience. A $10.00 tribal permit for each person 12 years of age and over is required to fish in Cherokee streams and ponds. Children under twelve are allowed to fish with a permitted adult. Two, three, and five-day permits are available at a reduced rate and a season’s permit costs $250.00. No other type of fishing license is required nor accepted on the reservation. Most of March is closed to fishing with the annual season opening the last Saturday of March, continuing for eleven months and ending the last day of February the following year. Throughout the season, fishing is allowed from one-half hour before sunrise to one-half hour after sunset. Creel limit is ten trout per day per permit holder. Regular stocking of the streams is the responsibility of Cherokee Fish and Game Management that each year adds nearly 500,000 trout to an existing population of fish. These supplemental stockings include rainbow, brook and brown trout of various sizes ranging up to trophy size. · Tackle is limited to fly rods, reels, and line with a maximum of 18 feet leader material or monofilament line attached. · Only artificial flies and streamers constructed of natural or synthetic material. · Only one single-hook fly per line permitted. · Taking of any live fish caught. · Use of any spin & bait casting rods, reels, lures, or tackle. · Use of any natural bait, fish bait or bait paste including fish eggs or derivative. 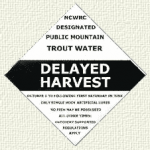 Delayed Harvest trout waters, excluding tributaries except as noted, may be fished only with artificial lures with one single hook. No natural bait may be possessed, and no trout may be harvested or possessed while fishing these waters between Oct. 1, 20011 and 30 minutes after sunset on June 1, 2012. These waters are closed to fishing between 30 minutes after sunset on June 4 and 6 a.m. on June 5. At 6 a.m. on June 2, 2012, these waters open to fishing for youths under 16 years old under Hatchery-Supported regulations—no bait restriction, no minimum length limit and seven-trout per day creel limit. At 12 p.m. on June 2, 2012, these waters open for all anglers under Hatchery-Supported regulations. These waters are marked with black-and-white signs like the one shown here. Bear Creek at its junction with Forney Creek. Fishing is limited to hook and line only. An artificial lure is defined as a fishing lure that neither contains nor has been treated with any substance that attracts fish by the sense of taste or smell. Natural bait is defined as any living or dead organism (plant or animal), or parts thereof, or prepared substances designed to attract fish by the sense of taste or smell. It is unlawful to take fish bait or bait fish from designated Public Mountain Trout Waters. It is unlawful to possess natural bait while fishing Wild Trout and Catch-and-Release waters, unless those waters are also specifically classified for use of natural bait. Dropper flies may be used when fishing any Designated Public Mountain Trout Waters. It is unlawful to fish with more than one line per person, except on power reservoirs and city water supply reservoirs. There is no closed season for fishing on power reservoirs and city water supply reservoirs designated as trout waters. Non-trout species may be harvested from Delayed-Harvest Trout Waters during the catch-and-release only trout season under applicable size and creel limits. It is unlawful to place hatchery-reared fish into a Wild Trout Water or move wild fish from one stream to another on game lands without prior written authorization. There are approximately 1,100 miles of Hatchery-Supported Trout Waters in North Carolina. In hatchery-supported waters there is no size limit or bait restriction, and the creel limit is seven trout per day. Hatchery-Supported TroutWaters are marked with green-and white signs that are posted conspicuously along the watercourses.